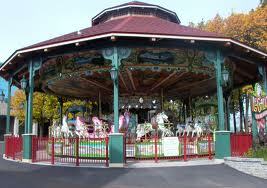 La Ronde is an amusement theme park in Montreal, Quebec, Canada, owned and operated by Six Flags. 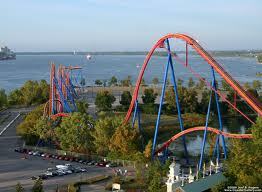 It is the largest in the province of Quebec and the second largest in Canada after Canada’s Wonderland, with about 2.5 million guests in 2006. The park is under an emphyteutic lease with the City of Montreal, which expires in 2065. La Ronde was opened in 1967 as the midway of the Expo 67 World’s Fair. The park opens from mid-May to late October, with peak admissions in July. As of summer 2011, entrance costs $44.99 CAN for people measuring 1.37 m (54 in) or more and $32.50 CAN for people under 1.37 m . A toddler under the age of 2 has a free admission. The site is accessible by automobile via a special exits off the Jacques-Cartier Bridge. On-site parking is available at a costs of $15 per day for regular parking, $20 on days when there are fireworks presentations, or $25 for VIP parking. A seasonal parking pass is available for $85 ($115 for a seasonal VIP parking pass).